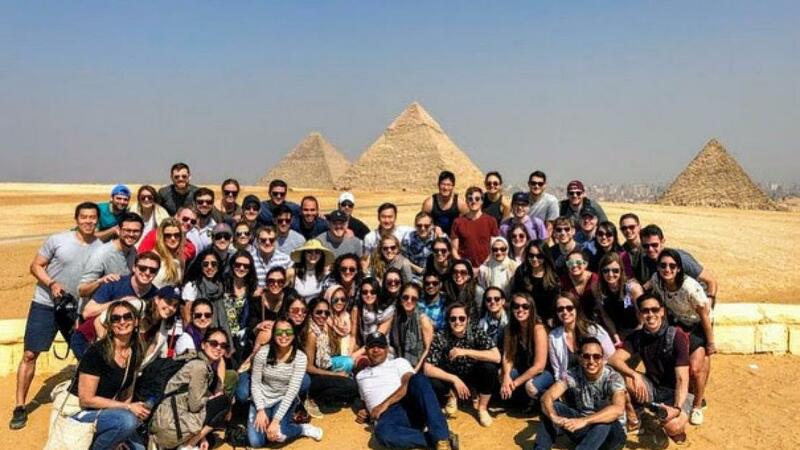 Shokouh Shafiei, an MBA candidate at Harvard Business School, now has Egypt on her radar after a panel discussion organized by the Center for Entrepreneurship and Innovation at AUC’s School of Business left an impression on her –– and more than 60 other Harvard students. Shafiei was among a group of students from Harvard Business School who stopped by AUC during their recent trip to Egypt to hear from Sherif Kamel ’87, ’90, ’13, dean of the School of Business; Ayman Ismail ’95, ’97, Abdul Latif Jameel Endowed Chair of Entrepreneurship, assistant professor and director of the AUC Venture Lab and Center for Entrepreneurship and Innovation; Hisham El-Khazindar ’96, AUC trustee and member of the School of Business Strategic Advisory Board; and Ahmed Zahran ‘02, CEO and co-founder of KarmSolar. Moderated by Abdelhameed Sharara, co-founder of RiseUp, the lecture aimed at introducing Harvard students to the great number of innovative projects crystallizing in Cairo –– many of them with roots at AUC. I was impressed by the amount of coordination and cooperation between key stakeholders –– the government, private sector and educational institutions –– behind a common goal: to build a competitive entrepreneurial ecosystem that can fuel Egypt's growth.